Club MacStories offers exclusive access to extra MacStories content, delivered every week. You can sign up for a Club subscription here. In addition to extra MacStories content, you'll also get a chance to be an awesome reader who makes a direct contribution to the MacStories team. That's pretty cool, we think. You can read a free sample issue of MacStories Weekly here. A sample issue of MacStories Weekly. 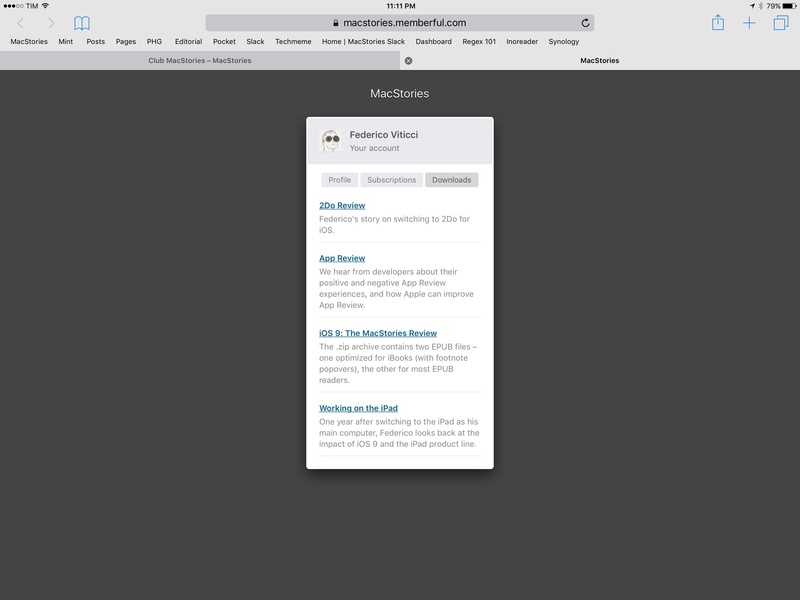 MacStories Favorite: A great app that deserves to be on everyone's iOS device or Mac. MacStories Collections: Our favorite apps, workflows, games, and more. Tip: Tips & tricks to get the most out of your devices. Home Screens: Interviews with friends of MacStories about their iOS Home screens, watch faces, OS X docks, and menu bars. Interesting Links: Great reads from around the web. Weekly Q&A: Each week, Club MacStories members will be able to ask questions directly to the MacStories team. Questions can be about anything – apps, Apple news, productivity questions, Italian cuisine – you name it. We'll pick a few ones and respond in each week's issue of MacStories Weekly for every Club member to read. App Debuts & Updates: The week's most notable app releases and updates. Ongoing Development: Trying new things, seeing what works, and discarding what doesn't. A column by John Voorhees. 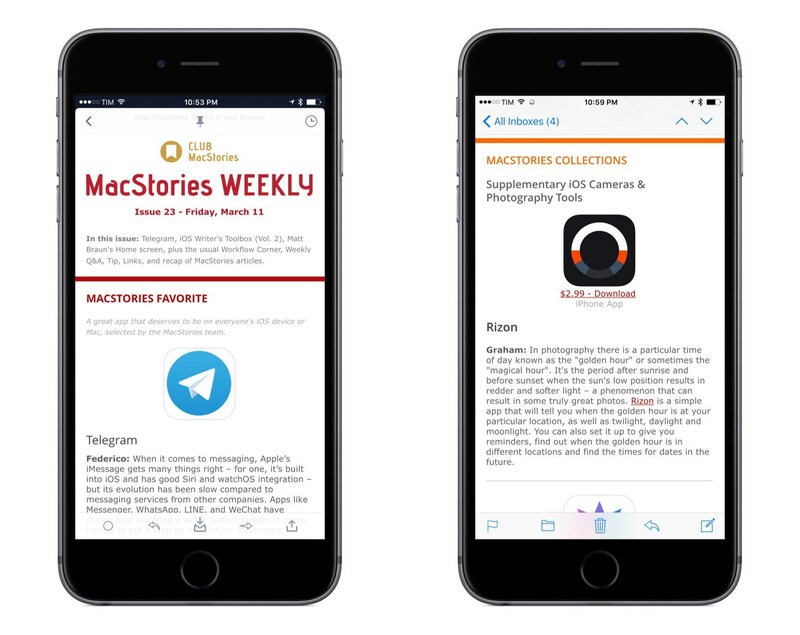 Workflow Corner: Each week, we'll help Club MacStories members with their iOS and OS X workflows. Submit your requests, and we'll try our best to come up with a solution. 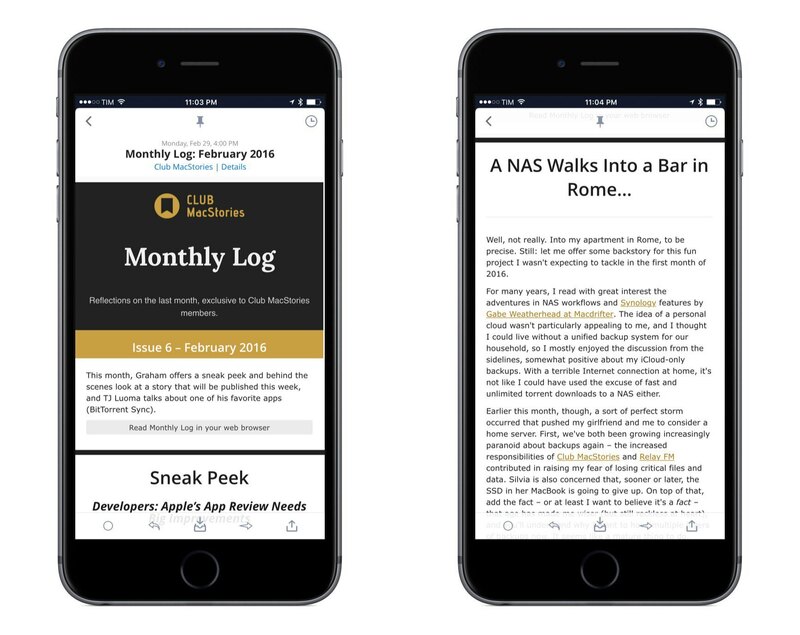 The Monthly Log is a second newsletter, delivered once every month. It'll offer reflections on the past month in Apple news and a collection of musings and notes on how we work and manage MacStories. Think of it as a monthly journal on everything MacStories – a behind the scenes mixed with a personal productivity journal. The Monthly Log will be delivered towards the end of each month and it'll be medium-to-long form, with original content exclusive to Club MacStories members. After seven years of MacStories, we've gotten to know quite a few developers who are behind the apps and services we use every day. Occasionally, with their help, we'll offer giveaways exclusively to Club MacStories members. In addition, our longer articles and in-depth stories are offered to Club members as eBook versions they can read in iBooks and other EPUB readers. Selected MacStories articles available for download as eBooks. Free downloads will be available in your Club profile under a 'Downloads' tab. Instructions for discounts and giveaways will be provided in MacStories Weekly or the Monthly Log. For general questions on Club MacStories and subscriptions, check out the FAQ page. If you're looking for the story behind Club MacStories, why we're doing this, and why we think this is a great complement to MacStories, read Federico's announcement here. Got feedback? Email us at clubfeedback@macstories.net. Since 2009, MacStories has delivered quality articles for the Apple community with a focus on depth, accuracy, and personal stories. Now we're ready for the next step. If you love MacStories as much as we love making it, we hope you'll consider becoming a Club MacStories member. This isn't just about good feelings and supporting MacStories directly (although that's pretty great): you'll receive what we believe are useful and informative newsletters every week, plus a recap of behind the scenes and more every month.